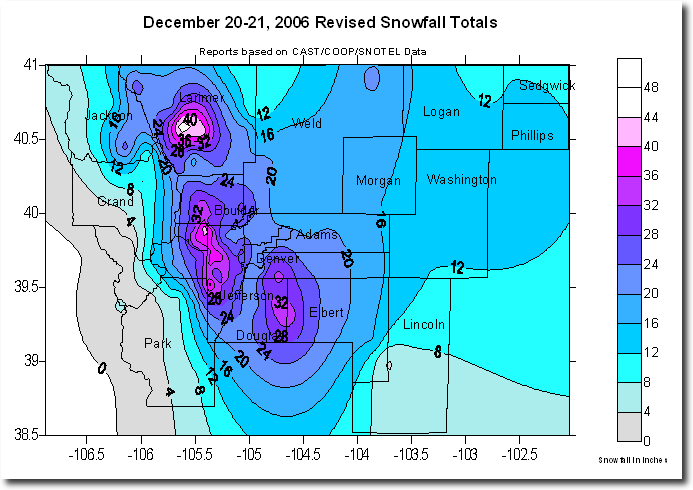 January 2006 was the warmest January on record in Fort Collins, Colorado – and much of the US. The average January maximum temperature was 52 degrees, and I spent much of the month in a short sleeve shirt. In February I moved to the Bay Area. I moved back to Fort Collins in mid-July, and it was incredibly hot. Driving across I-80 in California it was 116 degrees. Our pool in Cupertino got hot all the way down to the bottom. Global warming was a sure thing – I was convinced. But something happened in September. I was coaching soccer, and the weather turned cold and wet. We spent a lot of games bundled up that year, and in subsequent years. It stayed cold all winter. If the warm air in January and July was due to trapped heat, why did CO2 stop trapping the heat in September? So I started looking at the data for myself. It didn’t take long to understand that the people pushing global warming were not doing any actual science. This September has also turned very cold and wet here. It reminded me. It’s been hot in Chicago, that’s climate, and it’s been cold in Colorado, that’s weather. Cooler weather expected in Chicago on Thursday…. I must have shoveled that sucker four times in a month, and after I got it cleared the second time, the snowplow came by and left a wall of frozen slush across the drive. 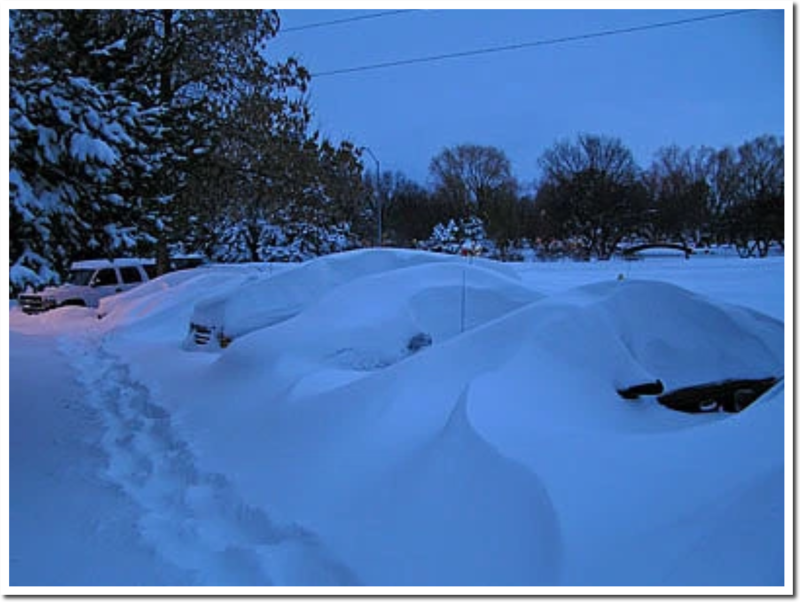 We sent lots of yardstick-measure photos to family and friends in California and other warm spots. I remember clearing our long driveway during that winter myself but what kind of relatives and friends are these people? I would reconsider sending them care packages during the next crisis when their local Trader Joe’s runs out of some organic product. Fortunately I cooled off a bit. I had already been infected by Julian Simon and it was a quick jump from him to Lonborg. Lonborg came across Simon’s, “I predict that 100 years from now we’ll all be wealthier, healthier, air will be cleaner etc etc.” Lonborg was offended by such optimism and set out to prove Simon wrong. And ended up being convinced Simon was correct. I thought Sceptical Environmentalist was a good book but Googled around it to see what others said. I found out from Real Climate that although he seemed pretty harmless, Bjorn was actually SATAN! Well, that didn’t seem right. Googling, Googling… Real Climate… Climate… oops… Climate Audit… Started reading McIntyre before he was even E-E-E-EEVIL (he whose name must not be mentioed). He had just gotten into Mann’s secret data and was fiddling with it, going… huh. Anthony Watt was a humble commenter. Judy Curry was sceptical of scepticism. Cognitive dissonance is a prelude to growth. For Lonborg it was being really pissed at Simon. For McIntyre it was finding that the actual numbers behind the panic didn’t add up. Watts got his first look at thermometer placement. You tell your story here. This is a rambling way of getting to it but your contribution is remarkable and right there with those guys, going on from where they got us. Thanks for talking about what got you here. One of the great truths is that if somebody can’t tell you the moment that it all changed for them they’re full of crap. In the 1980’s El Nino was the buzz word in Australia as one of the worst droughts in many decades hit Australia. By the end of the decade Global Warming was appearing in the media and by the end of the 90’s, we were all being blamed for it, mainly by Al Gore and a few of his minions. All through that time, I never questioned the media releases on weather/climate even though I knew the mainstream media lies constantly about almost everything. Then in the 2000’s I read State of Fear by Michael Crichton & saw his temperature charts of Alice Springs and Darwin in particular. I had lived in Darwin in the 70’s & 80’s. It wasn’t getting hotter. Why was it immune to “Global Warming”? Then I saw Al Gore’s movie. Oh well I must be wrong. Then I read one of Tony’s first blog posts way way back. Straight away, I went to the BoM Australia’s website and started checking the data records of Alice Springs, Darwin, Perth and Newcastle and all the places I’d lived where I’d expect to see warming. I was shocked to find no warming. I remembered Michael Crichton’s book and re read it and checked the charts. No Warming. WTF. Then BoM did their ACORN adjustments to the temperature record and ALLELUIA!! All of a sudden there was warming everywhere, but particularly the major cities. I smelt a rat. The more I looked into the Australian temp data and rainfall data, the more I found it didn’t match the alarming predictions. The final straw was when Ross Garnaut, an economist, proposed a bloody Carbon Tax to save Australia’s weather. Since when has a tax saved anything? never. It’s one big fat lie. Anyone who defends the climate scam has very questionable character and is not much more than a pimp for the carbon credit banksters in London and New York. Any scientists who defend it are either bought off or are not real scientists. PS Keep up the great work Tony. The Borg is definitely being disrupted. For me it was reading the work of David archibald I believe in 2007 or 2008. This is what all those freaks in the global warmism religion/cult need to grasp that most of us evil “deniers” used to believe in it at one point and then saw it was BS, Tony’s work being a big reason of cementing the knowledge it is BS for many. I expect the frauds who are the leaders of it to attack as they need to since they know they’re pushing BS but the regular believers should see exactly who the evil heretics are and what their history is. What makes this religion/cult so bad compared to others is they try and claim it’s science when as we see it isn’t. For me that magic moment was the first time I ever heard the theory. I had accepted the green house gas theory of course. I still do, but with caveats. But, hearing that CO2 was driving dangerous warming just jumped out as preposterous to me. There is no way a .0004 change in the composition of a gas mixture would create a discernible change in its physical properties. Yes, when you consider the total summation of change from a massive volume of such a gas mixture it does sound impressive, but that is misleading. The amount of change per unit volume is indistinguishable from zero. Like throwing a gallon of acid into a large pool. Yeah, that’s a lot of acid when in a jug, but it won’t affect the pool very much at all. But it was more than just that. I also have a pretty good background of knowledge in history and other subjects. For example the Vikings settling in Greenland and exploring into Canada. The British growing and exporting wine during the MWP. Hannibal taking elephants through the Alps during the RWP. In Roman times, Egypt was the bread basket of the empire and it was pretty warm back then. And your average Roman stood a pretty good chance of living a long and healthy life. Contrast that to the famines and plagues the ravaged Europe when the MWP ended. Or the brutal winters settlers in New England faced. Warmth has always meant life and abundance, cold has meant famine and death. The entire thing makes no sense at all. True, an awareness of history can save us from unnecessary blunders. I was tipped off early when I noticed that all the usual suspects immediately jumped on the alarmist bandwagon. They are still riding it as you can see when you type “Marxism” and “climate change” in your favorite internet search engine. Blunders like that committed by the knuckle dragging morons in London, who knelt for the Star Spangled Banner, and yet stood for God Save the Queen? It was the British who insitutionalized slavery in the new world, and it was Americans who ended it. The Brits continued to allow slavery in India long after we fought our deadliest war to end slavery. Note that none of this happened while Obama was in office. This crap is just another Trumper Tantrum, committed by infantile idiots. Yes, the key word is “can” but it’s also true that nothing can save complete morons. And nothing can completely shield us from complete morons. To me the real start of that is really the case of the media against George Zimmerman. Zimmerman was acquitted by a jury composed mainly of black women in what looked to be a fairly cut and dried case of self defense. However, Zimmerman had already been tried and convicted in the court of media lies and distortion, fueled by the Reverends Al and Jessie, along with other voices of outrage. The media carefully edited the 911 call to make it appear more racist, they chose to publish pictures of Trayvon where he was years younger, they said Zimmerman was white when he is clearly Hispanic, they lightened his pictures to further that deception, and finally they darkened or turned pictures to black and white to hide the blood on his face. And of course Obama weighed in on the thing say he could have been his own son. The police were raked over the coals for not prosecuting Zimmerman because of racism, when in fact they made the right call based upon the evidence. It was clear as day at the scene Zimmerman had his head beaten against concrete. This was back in 2012, Ferguson came after. If anything Ferguson represented not only a media feeding frenzy it was also a case where people close by jumped on the opportunity to lie about what happened. The media lapped that up and spread it far and wide. Once again, the justice system acquitted when the media had already convicted. In both cases when the truth did come to light it was too late. The mod had already been stirred to a frenzy. Even today the idea Trayvon and Michael Brown were murdered in cold blood is regarded as gospel truth. Because emotion does not just over ride logic, it shuts it down. The greater the emotion, the less likely it is for logic to gain the upper hand. If you consider this, you see why the fiction of AGW has such a hold on portions of the public. Good propaganda does not appeal to your logic, it appeals to emotion and fear. It appeals to an innate desire to hate. That is why they frame the debate as they do. Those who disagree must be seen as evil. Nonexistent funding from shadowy evil corporate giants must be insinuated. Conspiracy hides itself best by painting itself as a counter to conspiracy. And then there are the useful idiots. I have a millennial in my office that told me she does not care what the facts are, she knows what she believes. Cannot fix stupid. Then in 2016, Wikileaks broke the DNC and Podesta emails. What I found in those emails was very disturbing, but even more disturbing was the fact that the MSM not covering it. So doubts began to emerge and I was subconsciously reminded of all of those “nutty” climate change deniers I had derisively dismissed. However, the nagging doubts that Wikileaks brought to the surface bothered me enough to decide that I would devote a “single day” to checking the science behind the theory of AGW. In the video, Dershowitz says that Ted Cruz was the brightest student he had ever had at Harvard. So, there it was. How was it possible that Dershowitz’s brightest student at Harvard was supporting all of these “nutty” climate change deniers? My PhD is not from Harvard. A Harvard PhD is in a different league, and therefore I have the greatest respect for any individual that does have a degree from Harvard. So the question then became: Who has the truth here? Me or Ted Cruz? Anyway, what I thought would be a single day of perfunctory record checking led to a much longer and involved process that finally led me here, to “Steve Goddard’s” blog. And my jaw just dropped. This could never happen in the “hard ” basic sciences of chemistry and physics. It is outright FRAUD. Welcome to reality. I never bought the scam because it was perpetrated by the same people who attacked the nuclear power industry. They just moved the goal posts. My story is about the same, PhD in chemistry, just accepted AGW on the face of it as I was taught. My awakening was born from GW’s promotion of it in about 2002 or 2003. I was more a liberal then and despised the neocons for the war in Iraq mostly. This led me to do my own research and fact finding and the realization that we are being had. Awesome stream of consciousness, very logical progression. That Sierra Club testimony is a classic (Gowdy would have also craved him up). He probably got a bunch of pats on the back – “you showed them” that’s how stupid these people are. I wish Cruz corrected him on the 97%, what an outright lie! I subscribed to “Weatherwise” magazine as a kid in the 1960’s. They had a feature article about the heat of the 1930’s, which was absolutely crazy compared to the heat of my own time. Then in the 1980’s, witnessed the citrus industry in FL pushed way south due to repeated severe freezes. Finally, a meteorology professor told me that even the pure radiation theory behind CO2 being a meaningful greenhouse gas was flawed and based on a lot of dubious feedback assumptions. Around the same time, same professor was groveling for Government grants and telling me how much he hated doing so.